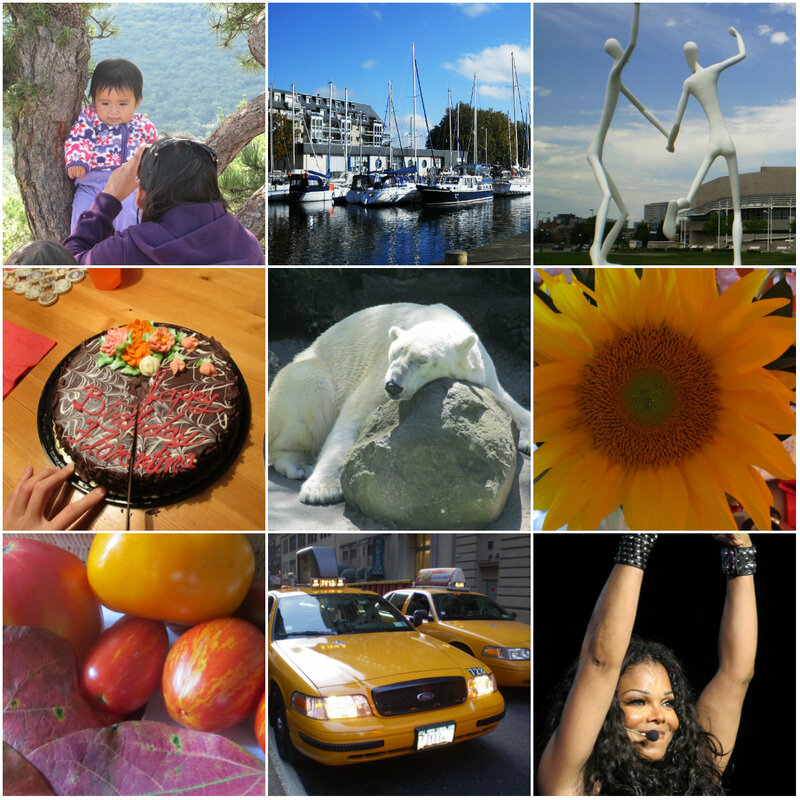 Weekly Photo Challenge: Happy! Happy is varied…. I was not your typical happy child. I was shy, serious, bookish actually, and only found happiness when I escaped to that place of fantasy all children harbor within. It was a colorful, vibrant, and blissful world populated by people with sunny smiles and warm embraces. That inner world was also filled with music, delicious food, kids who shared toys, and kind folk; their kindness was palpable, and now that I think about it, their kindness was compassion. I’ve tried to capture the mood/colors in the collage above. Hope you like it. Smile more. Recently, a wise friend said that smiling triggers happy feelings. What about fake smiles? We asked. “That’s okay too, keep smiling; even if you fake it till you make it… The biochemistry of a smile leads directly to happiness,” he said. I like that. Are there situations that make us unhappy? Sure. It’s not that we should pretend everything is honky dory, but that we must ask: Where is the lesson? How do I move back to that place of equilibrium? Every day, I choose to – be happy. More below! This post was inspired by a prompt from WP Daily Post: Weekly Photo Challenge: HAPPY. Happy. I can’t believe we haven’t done this theme before! That alone makes me happy. But there are so many things which could make you happy, so why not group them together to multiply the happiness? Here are some images which make me happy: a sunny day, Mums for Mom, exercise, coffee (of course! ), a Vespa by the sea, a Popsicle, funny signs, and more coffee! Share (many) pictures in a gallery which mean HAPPY to you! Weekly Photo Challenge: Happy « What’s (in) the picture? 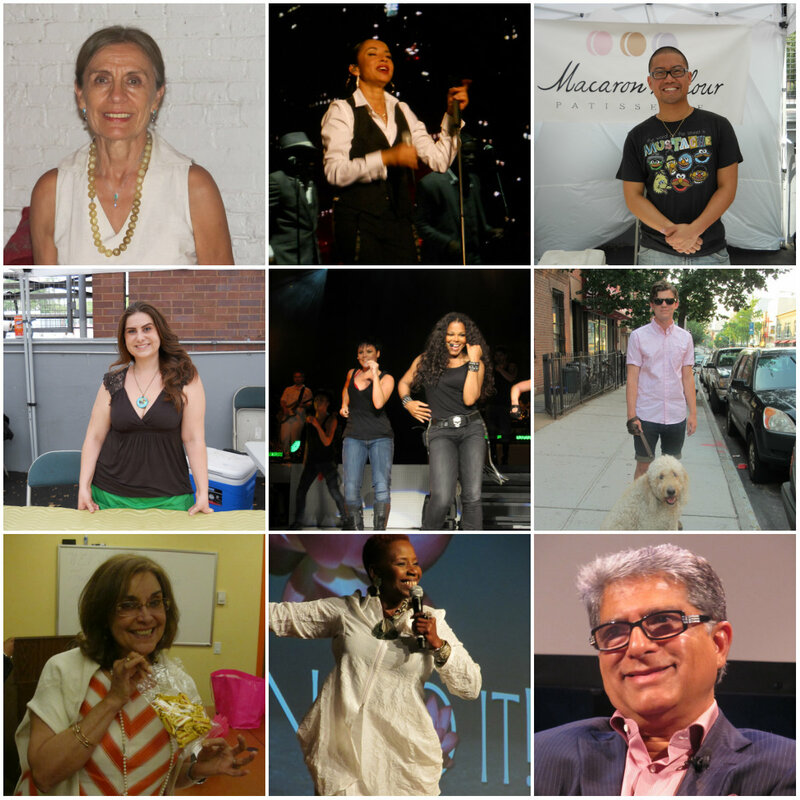 Weekly Photo Challenge: Happy « Living, Loving, Laughing, Snapping….. I have to go out in a sec. but am coming back to read this brilliant post again – thank you and I am smiling! maybe I should try that on guitar? What a great spread you have here. This is beautiful. Still don’t know how to do multiple gallery shots though that are separated across themes. Hmm… must fiddle with this function more. Lovely! The pictures and the words and the quotes! Your quotations are to be treasured. Photos wonderful too. Thanks for the mention. Reading your WPC makes me happy. You did didn’t you!! I have lots of great comments to reply to now 🙂 Thanks for the visit! 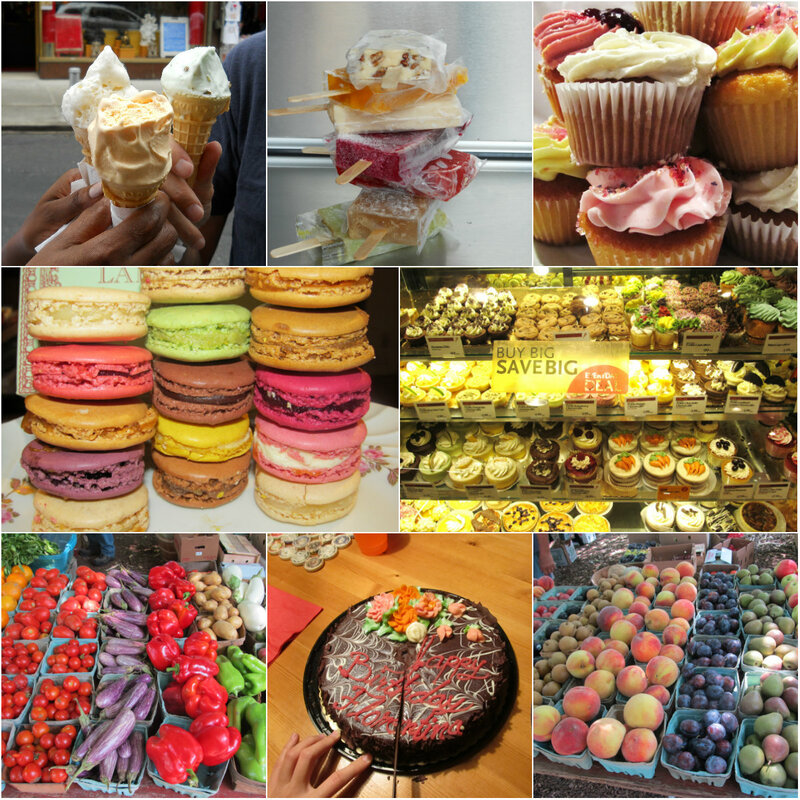 Love the photos of all that deliciously decadent food, Elizabeth – yum. What happy collages and some quotes from my favourite Russian authors!! I agree..you choose to wake up with a smile!!! Each morning when I open my eyes I say to myself: I, not events, have the power to make me happy or unhappy today. I can choose which it shall be. Yesterday is dead, tomorrow hasn’t arrived yet. I have just one day, today, and I’m going to be happy in it. Groucho Marx what a great way to wake up today, thanks so much! LOVE the collage! I always look forward to your photo posts. A vespa by the sea that does sound wonderful!. :+) I feel content just thinking about it. I think I might stop and have some of those lovely desserts and pretty fruits and some coffee too. Thank You for the moment of peace. A vespa by the sea sounded wonderful to me to… 🙂 TY for the kindness. Excellent post and excellent application of the new options. When I scrolled through the images with the slideshow function, the cat on the keyboard was especially heartwarming! Beautiful post. I completely agree. My blog is all about joy so I think we are in a similar mindset! I’m not sure how to do it but I left a link on your Solitary post. WordPress closed comments on Solitary and I was unable to post it there. If I leave my link in your comments section is that how to do a pingback or is there another way? Oh, I forgot to say thanks for putting mine in your list. I’m very honored! What makes us happy is so varied. I think you caught that well with the photos you selected. Thank you for the pingback. I love the quotes you attached on the post 🙂 Thanks for bringing them up. What a cheerful happy post! Made me feel cheerful, too. You made me think, Eliz, of my childhood and whether I felt happy. I suppose I was too busy going about all the things children do to think about it! I knew you’d have a nice collection of photos for this topic–love your kitty sleeping on the computer. Mine does it too, even while I am using it, she parks herself atop it! You know Elizabeth, being able to feel optimism is such a great gift. How lucky to have that since childhood. 🙂 Showed your photo collection to my daughter Chloe and now she wants to tie dye all her sheets rainbow, peace sign! Thanks so much for becoming a Follower. Oh my–what amazing food. I’m on a gluten-free diet. It’s like eating cardboard half the time. Not happy. I was just thinking, Jake must have a Tweetdeck for WordPress. You are able to respond to everyone from everywhere so quickly… You rock man! Calgary has pretty boring exterior colours too – so I jazz mine up inside – red dining room wall, mango coloured around it and on a feature wall. Apple green in the bedroom – definitely a colour person – then there’s my wardrobe LOL. I don’t know why you keep disappearing from my reader, Elizabeth, but I need to keep track from my email. Too many delays, and I enjoy your positivity! You are so good at keeping up with the photo challenge, and I love the prompt “Happy.” You’re so right that the word elicits different responses from each of us, but I particularly like the photo collage of faces. There is nothing like smiling faces to lift my spirits. I can honestly say my family makes me happy. These days, though, my two young granddaughters send me into the stratosphere with happiness. Their little smiles can melt my heart! 🙂 Love this, as always, Eliz. I’ve subscribed by email this time,we’ll see if that works! “If you want to be happy, be.” Keep smiling! Great quotes! It’s nice to know that so many people have found the secret to happiness. Beautiful post! Effective use of the gallery format. I want to thank you so much for all your visits to my blog, the comments, follow, and the above mention. I am so honored! How could I not follow you back? Thank you, my new-found friend! Thanks. I plan on it! HI! I love the happy food collage! This week’s challenge is right up your alley,your blog is always so bouncy and bright 🙂 You have inspired me to lighten up my own blog a bit more. Wonderful photos! I especially love that sleeping cat by the notebook. You’re absolutely right – happiness is a state of being and a choice. Wonderful photographs, I loved the cat pic. I also am a self-proclaimed happy-go-lucky kind of person. Though sometimes, being positive has its negative connotation to it. Great collection of happy photos! Often, the things that make us the happiest are things that cannot be bought. Weekly Photo Challenge: Happy « What's (in) the picture?